That was an enormous release of energy in the image above! 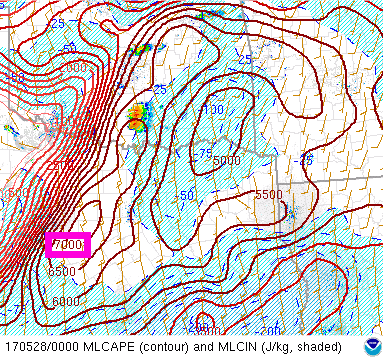 This analysis from the final Saturday in May is complicated but what jumped out to meteorologists was CAPE (convective available potential energy) in excess of 7000 joules per kilogram, which is an extreme value. 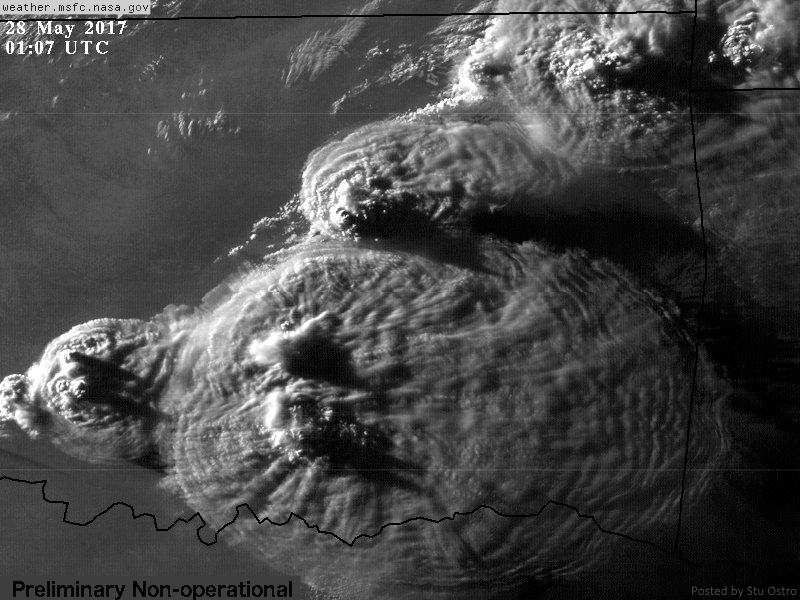 And when it was unleashed, BOOM went the atmosphere, with amazing detail seen on our new GOES-16 satellite imagery at sunset. The result of all that? A slew of severe weather reports across a long swath, including one or more derechos. During mid-month there was also a derecho, that one farther north, and a series of tornado outbreaks on multiple days. 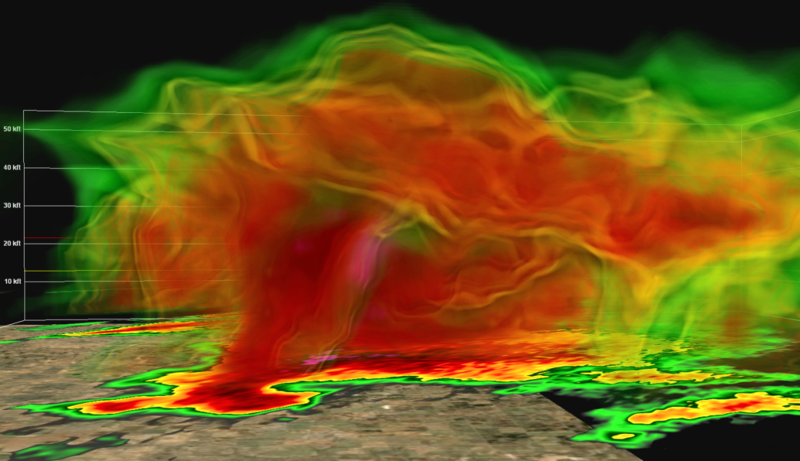 A tornadic supercell over southwest Oklahoma on May 18 had this structure on radar. While Himawari-8 has been in orbit on the other side of the world for a while, this is the first time we’ve had satellite loops with this resolution for spring tornado season in the United States, where more twisters occur than anywhere else on the planet. This one of preliminary non-operational GOES-16 imagery via College of DuPage included the time of the radar image above. Also on the 18th, at the beginning of this loop from NASA a deadly tornado hit Wisconsin, then the storms evolved into big intense clusters as the sun set. And on a day earlier in the month with severe weather in the Pacific Northwest, check out the swirl captured by the new satellite near the California/Oregon border in the lower left, from where the incipient storm clouds came. This eruption over Denver on May 8 may have been the costliest hailstorm in Colorado history. These storms over Cuba on the 21st could be seen by radar—and by people in the Florida Keys including my wife Leah and me on vacation there—more than 150 miles away! Tropical terminology from convection to wind shear! We Love Weather’s Top 10 Photos of the Week!